One viewing isn’t sufficient for a comprehensive “review” of a movie like this. Like Roger Ebert, who called Cloud Atlas “one of the most ambitious films ever made,” I knew before it was half over that I wanted to watch it again. Different critics have praised and panned the movie. I want to offer a brief synopsis and weigh in with a solid two thumbs up. It’s harder to move around in time in movies than in books. Inception 2010, notably altered the linear flow of time, with four levels of dreaming that unfolded simultaneously, yet fundamentally it was structured as a frame-tale. Scheherazade did the same thing centuries ago in the The Arabian Nights. Counter to what I expected, the different stories were not hard to follow. 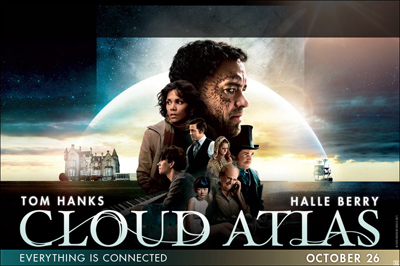 Anyone interested in fresh ways of imagining novels and movies should not miss Cloud Atlas. I’m pretty sure you’ll want to see it more than once. This entry was posted in Books, Culture, Fantasy, Movies and tagged books, Culture, fantasy, movies, science fiction. Bookmark the permalink. I have seen some trailers for this on TV and really want to get out to see it. I suspect it will be better on the big screen than on my TV, so I’d better get to the movies. When I was reading your review, it brought to mind a wonderful book I used to teach called Kindred by Octavia Butler. I’ve often wondered why it was never turned into a film. It’s a book I think you would really enjoy. (If you decide to read it, DO NOT read the foreword. It will ruin the book for you.) Thanks for the head’s up on Cloud Atlas. I saw trailers for several compelling movies due in the near term, notably The Hobbit, Daniel Day Lewis in Lincoln, a new Anna Karrenena, and one other based on a literary classic which my brain did not retain.